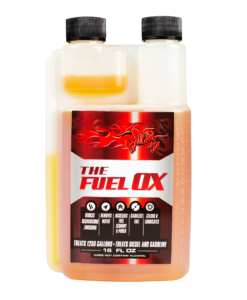 Fuel Ox Marine™ is a multi-functional and comprehensive fuel treatment that enhances gas and diesel combustion and engine performance. Fuel Ox Marine™ removes water and protects against carbon and sludge build up, ethanol issues, corrosion, and degraded fuel in both gas and diesel. Fuel Ox Marine™ enhances combustion and provides an increase in fuel economy and power as well as a reduction in emissions such as soot and smoke. Fuel Ox Marine™ contains stabilizers to protect both gas and diesel from degrading and becoming unusable for up to two years. In the marine industry, the combination of ethanol mixed fuel or Ultra Low Sulfur Diesel and an environment surrounded by water is a blueprint for problems. Corroded or gummed injectors or carburetors, plugged filters, as well as the risk of phase separation can cause repairs on top of an already expensive investment. These issues that can cause significant damage to engines and cost you time and money. It’s no question that fuel additives are fundamental for a smooth operating watercraft. Fuel Ox Marine™ is not your average fuel treatment. Fuel Ox Marine™ protects and prevents common fuel related issues. These military grade additives are highly concentrated and improve combustion and overall engine performance. It is designed to be soluble in any fuel and drastically improve the efficiency of the fuel systems that are treated while inhibiting common fuel related issues. I’ve started using Fuel Ox Marine™ about two years ago. We’ve saved about 7% on our fuel, the engine runs as smooth as I’ve ever heard it, and there’s absolutely no exhaust emission. I can truly recommend the product. A multifunctional and performance enhancing marine additive. It is designed to remove water from fuel, significantly delay phase separation, and provide better fuel efficiency. An “end-of-season” additive to maintain the effectiveness of fuel that will sit in fuel tank. Captain Brian Bacon of Big Game Sportfishing uses Fuel Ox Marine™ in all over his boats : gas or diesel. He loves how it reduces emissions, removes water, and increases power and fuel economy. I have been using Fuel Ox Marine™ for three years. The engines in both boats are running great, with very little soot, and a definite increase in performance and efficiency. Unlike other additives, you only need to add a small amount to treat a lot of fuel, so a bottle goes a long way. I highly recommend it for any fuel application. We use Fuel Ox Marine™ with every fill up. Not only have the motors run cleaner, we have improved our fuel consumption. This is a must use product for any and all boats. We’ve been using Fuel Ox Marine™ for the past few years for our own use on winterizing all of our engines and outboards. In prior years using different fuel additives, we had some issues with spring start ups. Since switching to Fuel Ox Marine™ we’ve had no problems with start ups in the spring. I’ve also turned a lot of my customers onto it, and they have found they are improving gas mileage. I also use the product personally and happen to think it’s a very good product.